I wanted to try something new, and so I thought why not margarita cupcakes! It sounded fun and adventurous. After a little inspiration on proportions (and lime juice! ), I pretty much winged the rest. I had no idea how they would turn out, but I decided to replace the normal liquids with fresh lime juice and pure agave tequila. For the icing, I decided to use my buttercream recipe, but spiced it up with blue curacao liqueur and a couple drops of yellow food dye. End results? The icing was PERFECT. The cupcakes? They were a little stronger than I wanted them to be, so it overpowered the lime taste. Just a little. I think I may use just a little less tequila next time (my hubby's coworkers all thought they were great, though!). But aren't they pretty? 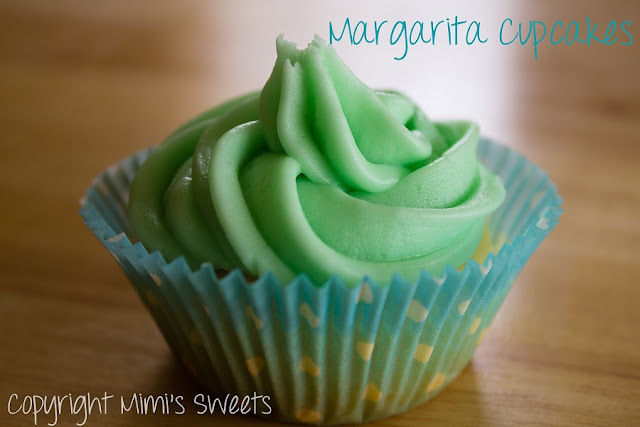 What type of drink do you think would make a good cupcake? So glad you think so, Carmen! Would be more than happy to ship them to you!